Leverage the power and expertise of our JAUS experts for your needs using the OpenJAUS JumpStart Kit. Why spend months learning JAUS, AEODRS, IOP or other program-specific documentation? Our in-house engineers take that knowledge and your specific requirements to build a custom solution for you. This allows your company’s engineers and developers to focus on what they know best: your hardware and software. 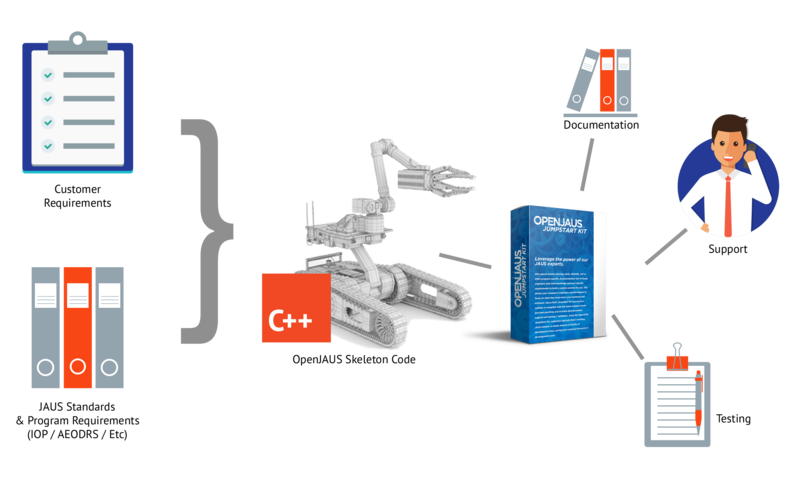 OpenJAUS’ JumpStart Kit ensures your solution is compliant with the latest industry trends and best practices and includes documentation, support and testing / validation. Using the OpenJAUS JumpStart Kit, customers typically field a working JAUS solution in weeks instead of months of development time, saving your company thousands in development costs.